I cycled away from Dublin two years ago but returned last week, curious to see how things had changed. 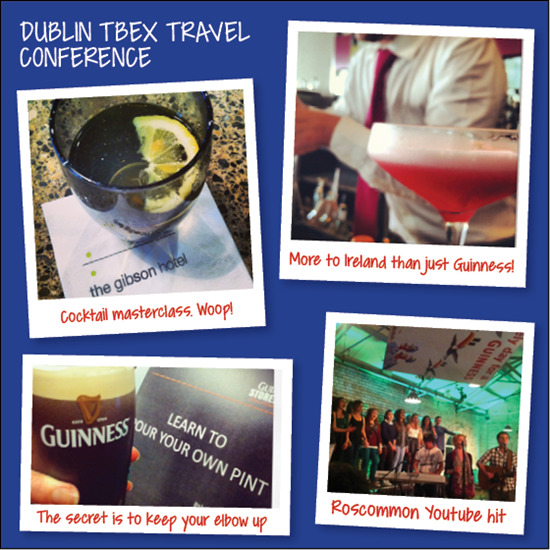 I flew to Dublin for the TBEX conference, the world’s largest gathering of online travel bloggers and journalists. (Previous conferences have generated a whopping 16.2 million blogs and tweets.) Understandably this kind of attention is incredibly valuable to a destination like Ireland. It was also a great opportunity to recruit and meet OutTrippin travel experts and an excuse to catch up with old friends. I moved to Dublin from 2008-2011 so I was witness to the financial collapse and was interested to see what had gone down in the 2 years I was cycling the world. As soon as I landed, a grinning Failte Ireland representative greeted me with a welcome pack of maps, transport vouchers and the impression that they'd finally got their act together. Perhaps the penny (or cent) had dropped when post Celtic Tiger, it dawned on the government that tourism might be Ireland's best bet. Forgetting Americans who come to seek out their Celtic roots, (President Obama’s great-great-great grandfather was born in Moneygall) how would the modern tourist be rewarded for choosing the Emerald Isle for their vacation? I never cringed but I did feel a little uneasy at times as Ireland's new personality was thrust upon us like a sledgehammer. But the audience's faces (and iPhones) lit up and the fruits of their vision were tweeted, instagramed, pinned and blogged about. The conference itself was a fascinating courtship between bloggers and businesses. Both understand that they need each other but neither are willing to give much away. Travel bloggers wield new power, in a digital world where they have serious influence. Travel operators need positive reviews and content to be successful but little idea of how a mutually beneficial agreement can be realized. There were horror stories of bloggers holding companies to ransom and other companies exploiting bloggers. 2013 is not the year this will all be resolved but I think getting everyone in the same room is a solid step in the right direction. As part of the conference there were plenty of famil trips available to interested bloggers. 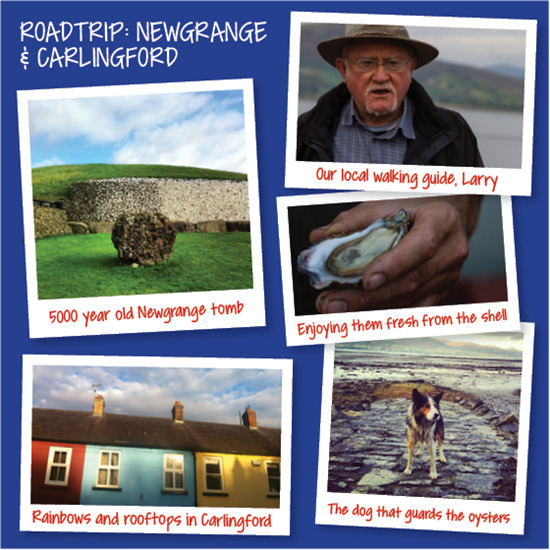 I opted for an afternoon cocktail masterclass at the Gibson Hotel and a daytrip to Newgrange UNESCO world heritage site and the seaside village of Carlingford. On the bus to Ireland's version of Stonehenge, we were gently instructed to use a specific #hashtag on all tweets and photos throughout the day. Even in the blogosphere, there's no such thing as a free lunch. (But for a 3-course crab cake, lamb and cheeseboard at Ghan House who's complaining?) We also visited the Carlingford Oyster Company and I was charmed by the hardworking team and the fresh oysters served up with prosecco. "When I was young, we didn't have Facebook. We had train tracks. We'd line up pebbles and watch 'em turn to dust as the train came through." There was a pregnant pause after his comment and I'm sure I wasn't the only blogger on the tour to wonder if our 160 character limit was confining our expression of the place. But then I was distracted by rainbow coloured houses that were just begging to be instagrammed, and the thought was gone. There has been a fundamental shift in the way travellers and destinations interact. 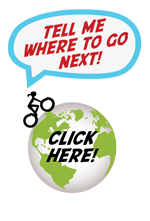 Travellers have a ridiculous amount of information at their fingertips and destinations have lots of new opportunities to connect. The hard bit is working out how to get the right information in front of interested people at the right time. I'm heartened that we're on the right path with our personally tailored travel plans on OutTrippin and I feel a tip of the cap is due to Ireland, for adapting so quickly. New York: What will Indiana June do in the big apple? Video someone with the nanny accent saying "noo Zealand, i love that place"
Where is Indiana June today?